Is Mt. 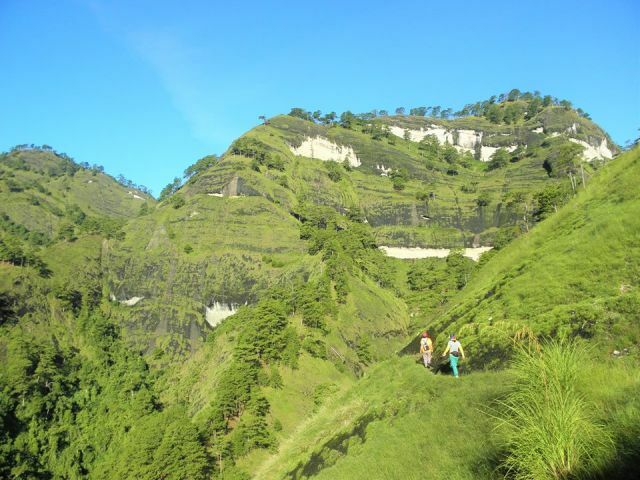 Kabunian In Bakun, Benguet Recommended For Beginners? This is the trail leading up to the summit of Mt. Kabunian in Bakun, Benguet. Someone asked if I would recommend the mountain for a beginner and by beginner I mean someone who hasn't climbed before. My answer is no. Try a much less difficult trail before you go for the likes of Mt. Kabunian. If you've read articles online describing the Mt. Kabunian trail as an easy trail, take their descriptions with a grain of salt. Lots of salt. The problem with most of the information you find online is that they've been written by experienced climbers. Needless to say, an easy climb for them can turn out to be a very difficult climb for you if you're a beginner. Mt. Kabunian isn't too high of a mountain but the trail can pose a challenge to beginners. In all honesty, it's the most dangerous trail I've ever been to. That's not an exaggeration. The trail especially the final assault to the summit features steep cliffs and rock drop-offs. One wrong step and you'll be hurtling down the mountain. See the picture below? The mountain at the background is Mt. Kabunian. You'll have to zigzag through the incline's rocky face to get to the summit which is the highest point on the upper right corner. It's easy to be comfortable while on the trail but you have to be extra careful of your steps. This is not in any way an attempt to discourage people from climbing Mt. Kabunian. It's an offering of advice that you be ready for the trail especially if you have a fear of heights. One last piece of advice: if you are planning to climb the Bakun Trio (Kabunian, Lubo, Tenglawan), it's probably better if you climb Lubo first. It has the easiest trail and it provides you some sort of a teaser of what to expect from the trails of the other two peaks. Welcome to the Cordilleras! Have fun climbing! Mt. Kabunian in Poblacion, Bakun, Benguet.